Canine Gates by Richell USA, Inc. 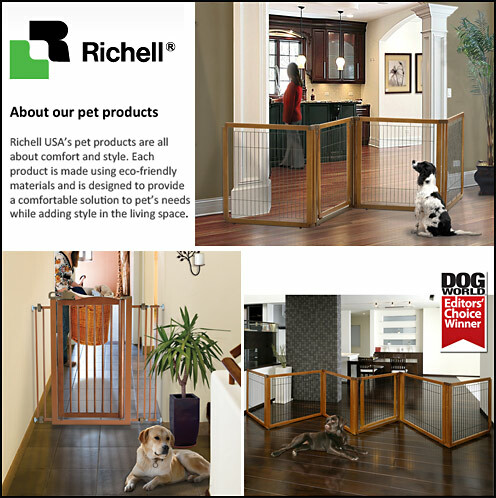 If you are looking for high quality canine gates that can add to the beauty of your decor and the comfort of your dog, then you want Richell USA! Richell USA is a distributor of quality home and pet products designed by Richell Corporation in Japan. Every Richell product includes the same excellent craftsmanship and attention to detail that earned many of its product designs the "Editor's Choice Award" for three consecutive years (2010-2012). Since its beginning in 2001, the team at Richell remains 100% committed to providing innovative products, non-compromising quality standards and excellent customer satisfaction. Richell's corporate office is located in Grand Prairie, Texas, just minutes away from the Dallas Cowboys and Texas Rangers stadiums. The company employs a full-time office staff in the USA and has a full-time supportive team at Richell Corporation, its parent company in Toyama, Japan. What Sets Richell USA Gates Apart From Competitors? Richell USA's products are all about function and style. Each product is designed with a specific purpose in mind. By combining elements of safety, comfort and mobility, Richell's products provide perfect solutions for busy families . . . and pets too! Richell’s wood pet gates, for example, are beautifully crafted from highly durable and eco-friendly woods, so each gate complements home interiors beautifully, just like furniture! Yet each gate safely confines your pet to his/her own "special" area in the home. Richell’s award-wining Convertible Elite Pet Gate is now available for small, medium, and large size dogs! The popular 4-panel pet gate can also be used as a room divider or pet pen and converts in seconds. There is a 6-panel available too! The gate includes a lockable door that allows you to move freely from room to room without having to shuffle the entire unit. Each panel locks in place at 90° and 180° angles using a specially designed cap, providing extra stability. The gate's beautiful hardwood construction complements Richell's other fine wood pet products. Wire Top and Floor Tray sold separately. Tool-free assembly! Gate stands at 40” tall to accommodate larger dogs, this gate’s "tension-mount" design allows you to attach it to doorway and/or hallway openings without damaging wall surfaces! Plus, the gate door opens in both directions and remains open at 90° allowing you convenient movement in either direction. The "one-touch" handle provides the option of opening/closing the gate with one hand, while the upper/lower lockable gate door provides additional pet security. Like Richell's other fine wood pet products, it’s made from eco-friendly rubberwood. • Gate stands at 40” tall to accommodate larger dogs. Richell's BEST gate yet! Our ever-popular freestanding pet gate is now higher, includes a walk-thru lockable Gate Door, and ADJUSTABLE Side Panels! Richell’s new Premium Plus Freestanding Pet Gate with Door fits doorway and hallway openings from 34” to 63” wide! Plus, the specially designed walk-thru door opens in both directions and includes an upper/lower locking system to allow free movement and extra security! But the best bonus yet is the specially designed Side Panels that adjusts in increments of 10° to allow you more options for use in your home! Simply adjust the gate to fit your personal needs! Last but not least, eco-friendly wood complements home interiors beautifully as well as Richell's other fine wood pet products! It doesn’t get much better than this! • Free-standing design allows for easy placement anywhere in the home, anytime you need it! NOTE: Richell has a large selection of gates to fit every need and situation. All quality, all built for both beauty and function. Make Sure Your Home Is Protected with Dog Gates From Richell USA! Richell USA's products can be found at these dealers . Call us today and we are happy to help you find a Richell USA dealer near you! 972-641-9795.